Sustainable development, global security and efforts to diffuse ongoing conflicts, many of which have resulted in explosive global refugee crises, top the agenda of the 70th anniversary UN General Assembly session that has begun its work in New York. 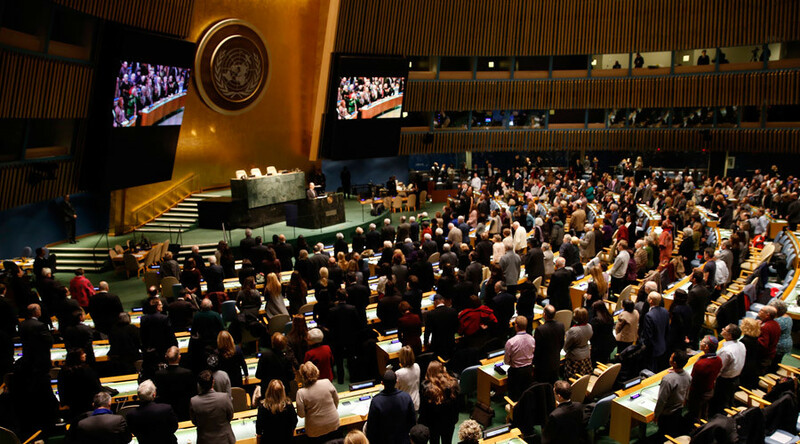 The United Nations General Assembly (UNGA) speech marathon will see more than 160 leaders in attendance at the 70th anniversary. Russian President Vladimir Putin, who returns to the UN after a 10-year absence, will be delivering his address on September 28. Cuban President Raul Castro is also expected to address the gathering for the first time in New York on that day. Other high-level speakers will include China’s President Xi Jinping, Iranian President Hassan Rouhani and US President Barack Obama. Speaking at the opening of the anniversary working session on Tuesday, President of the General Assembly, the Danish Mogens Lykketoft, urged the world body to deliver on objectives outlined in the 2030 Agenda for Sustainable Development. The agenda, which will be adopted during a special conference held between September 25 and 27, consists of 17 Sustainable Development Goals and 169 targets aimed at addressing climate change, economic problems, health, energy, education, agriculture, gender equality and a whole host of other issues. The Pope is also scheduled to deliver an address which will kick off the conference which is designed to shape the direction the world takes across the century. Besides tackling sustainability goals, Lykketoft urged the world democratic body to strengthen security around the globe and to remedy the impact which war zones have on civilian well-being and prosperity. “The UN and its member states have a strong obligation to work together to end the catastrophic wars and conflicts – not least in and around Syria. And we will have to act here and now to address the huge and explosive refugee crises resulting from ongoing conflicts – and to protect the human rights of all refugees,” Lykketoft said. "I will continue the work on the reform of the Security Council and in creating more transparency when selecting the next Secretary-General"
The UNGA president also promised to bolster efforts to revitalize work to reform the Security Council, after the General Assembly on Monday adopted a decision to continue long-running negotiations to increase the membership of the Council. Taking the stage, UN General Secretary Ban Ki-moon, urged the General Assembly to review peacekeeping operations which have thus far been tainted by numerous scandals involving UN peacekeepers around the globe, especially in Mali and Haiti. “In the weeks ahead, the General Assembly will deepen its discussions on my new report on the future of United Nations peace operations, and on the review of our peacebuilding architecture,” Ban said. Ban also urged GA members to address drug trafficking during the upcoming high-level debate on the World Drug Problem expected to take place in April.